Zaca Station’s soil is a mix of loose sand on top with a hard slippery base underneath. It is one of those tracks that looks like you can just hold it wide open and run it in deep, but in reality you have to be cautious about throttle delivery on lean angle at times or Zaca can bite you real quick (trust me, it’s bit me a time or two). The first positive that stood out to me was the MX33 rear tire’s ability on lean angle. Usually I am a very sensitive front end feeling rider, but the MX33 was so much better than the 3S on lean angle, under acceleration, that it was easy for me to dissect rather quickly. Rolling out of corners while under throttle the MX33 bites and doesn’t slide as much as the 3S when the the soil is slippery/wet. 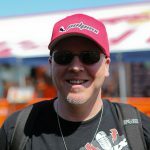 I was able to get on the throttle sooner out of slippery corners with the MX33 versus the 3S because of the positive connected feeling that I got from the 33. The MX33 rear tire also has a firmer feeling carcass than the 3S on square edge, which gave me slightly less comfort through choppy ruts and acceleration bumps. This was a very subtle feeling and some of you may or may not be sensitive to this, but this is something that I felt towards the end of our test day. Tire cushion is important when it comes to suspension feel and the 33 doesn’t have as much plushness as the 3S does. Straight line traction was better on the MX33 as there is less side to side movement from the rear end under throttle. Braking is something most do not talk about when comparing tires, but it’s a very important aspect when designing a tire for the public. You have to design a rear tire that has some slide for braking, but also have enough grip for acceleration. You have to cater to both types of riding styles (front and rear steering) when designing a tire and that can be a tough target to nail. The MX33 doesn’t have as much ability to drift (or slide) when brake sliding or pivoting around a corner compared to the 3S. The 3S slides slightly better when on the rear brake and the rider is able to pivot the machine more quickly than the MX33. “Now is that a good thing or a bad thing Keefer”? The answer lies in your riding style…If you’re a rear end steering guy you may want that drifting/sliding ability in your rear tire tread design/compound, but if you’re a front end steering guy like me, then having the rear tire not slide as much is more up my alley. 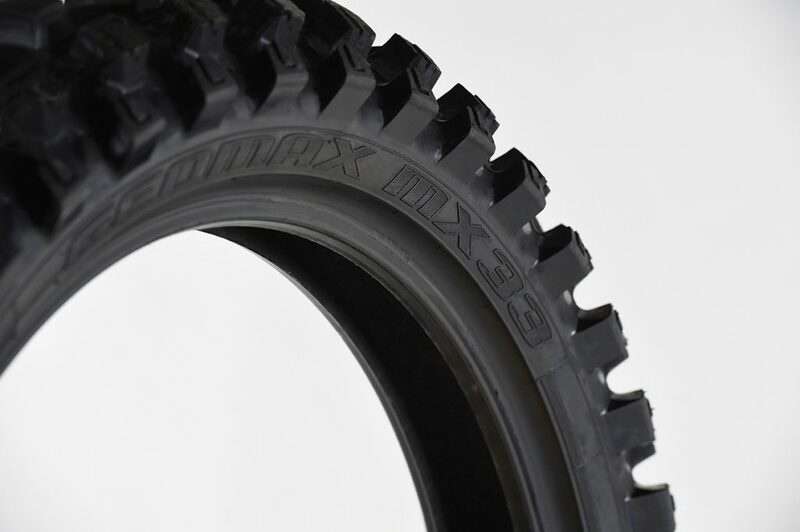 I am super picky when it comes to front tires and noticed a few things from the new MX33 that differs from the MX3S. The MX33 has more lean angle bite (off-throttle) when starting your lean for corners. 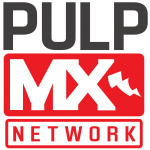 As soon as you get off the throttle to enter a rut or berm, you will notice the tire pulls down the front end more while biting the ground (very grabby). This may take some time for you all to get used to, but I like the fact that it doesn’t have that vague initial feeling like the 3S. Once the 3S gets into the corners its side knobs work well in soft-intermediate terrain, but I have always had a problem with that quick sudden “turn-in” with the 3S. 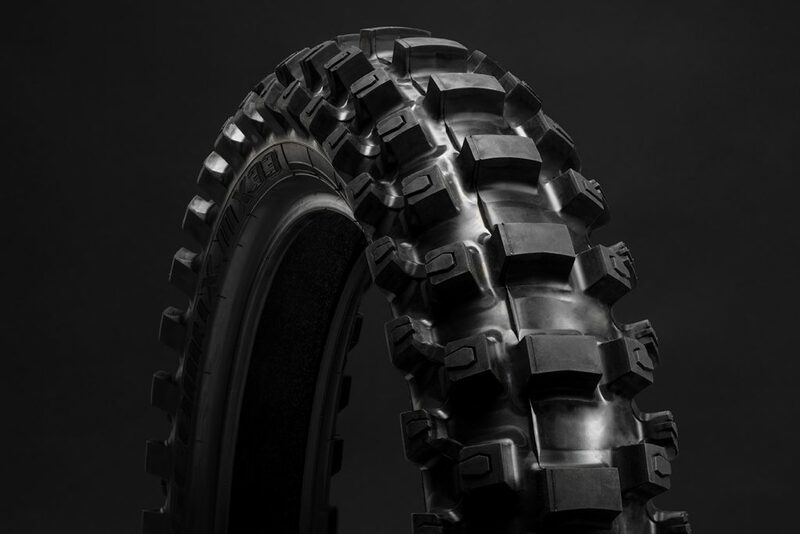 The MX33 front tire lets you cut down from a blown out berm or make sudden line choices (with your front-end) easier due to some extra lean angle grip. Where I felt the MX33 could be lacking is on-throttle maneuverability. When finishing your corner and you start to roll the throttle on, the front MX33 has a slight “Hunt And Peck” feel to it. “What is hunt and peck Keefer”? “Hunt And Peck” to me is when the front tire has a slight wandering sensation and doesn’t feel like the knobbies are dug into the terrafirma. I want to clarify that this feeling was only felt right out of a corner while under throttle. The MX3S never really feels like it has that “Hunt And Peck” feel to it under acceleration. Braking traction feel has improved on the MX33 over the 3S, as the tire doesn’t slide as much as the MX3S does when the track is freshly watered or greasy on top. This is a nice feature because the MX3S front tire sometimes was a handful when tracks received some water in the middle of the day. The MX33 front tire is also more consistent when scrubbing up faces of jumps and will not slide away from you as easy as the 3S. When the track is nice and broke in and all of that good dirt has been pushed away, the MX33 was noticeably better than the 3S. The MX33 was more consistent in all “off-throttle” situations and provided more bite, especially on lean angle when the track gets hard pack. 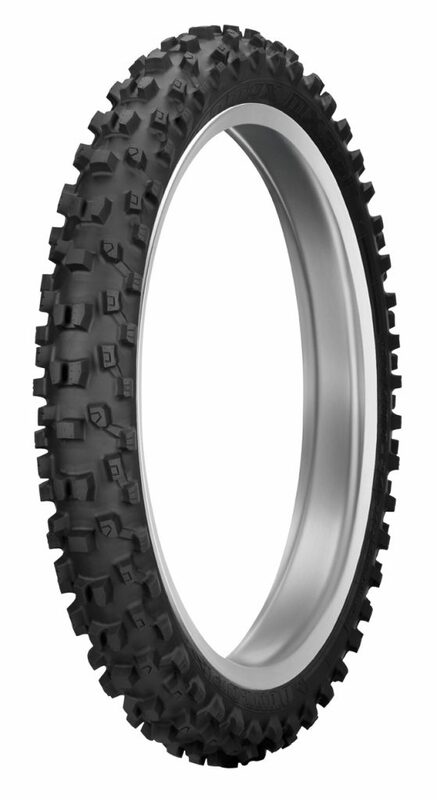 The Dunlop MX33 is available in 10,12,14,16,17,18,19 and 21 inch sizing. A new 90/100-19 sizing is offered by Dunlop in the MX33 as well. My first impression of the MX33 was a good one, but I really want to dissect these tires some more at different tracks next week. I will also be testing the durability of the 33, to see if the carcass is better (than the 3S), like Dunlop says it is when it comes to knob chunking. The MX33 should be available at your local dealer by Monday May 14th.